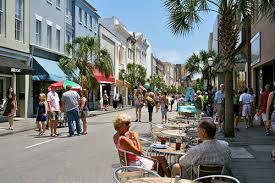 King Street is on a roll, having recently been named one of America’s ten GREATEST STREETS. 7. fosters an agglomeration of economies. This coming Sunday is the next installment of Second Sunday on King, which is one of the best recurring local events around. It promises to be an especially good one, since the street itself has just been so duly honored. The City of Charleston will have a special booth and setup displaying the prestigious award. Also, the Charleston Animal Society will be there selling their smokin’ hot firefighter calendars… and keep an eye peeled for some of the firefighter/models to personally sign yours. All proceeds go to Toby’s Fund, a very worthy cause which helps injured and abused animals. Also on tap – you may have heard about the Cronut, the food sensation that has usually jaded New Yorkers standing in line for hours out in the bad weather just to nab one. It’s a cross between a croissant and a doughnut and was invented and trademarked by French baker/artiste Dominique Ansel. Well, the good French bakers at Christophe here in Charleston have come up with their own croissant-doughnut hybrid, and they will be selling it on King Street this Sunday. Word is they’re giving Dominique a run for his money. Come taste for yourself what the hype is all about. One good option is to park in one of several parking garages run by the city. These allow you to park in the shade (unless you are on the top level). As a nice bonus, the city offers two hours of free parking in most of their garages during Second Sundays with a voucher. Here’s a link to print a voucher:http://susanlucas.typepad.com/2nd%20Sunday%20Oct%20Parking.pdf(If you’re in a Charleston beach house and don’t have access to a printer, they usually have them available to pick up at Second Sunday information booths, while supplies last). Most emails that flood the inbox are pretty rapidly deleted. Some are worth a quick chuckle or an “aww” over the latest cute dog or kitten pic, or the ever-popular animals who don’t normally like each other but are now bosom buddies (like the BLT — the bear, lion and tiger one is especially inspiring). But the other day, an email came in that was chock full of interesting facts. I found myself learning some new nuggets from it and thought I’d pass along some of the wisdom. Gold is the only metal that doesn’t rust, even if it’s buried in the ground (or in the ocean) for thousands of years. The song, “Auld Lang Syne,” is sung at the stroke of midnight in almost every English-speaking country in the world to bring in the new year. It’s a good day when you learn something new!